My article Restricted religious freedom in China appeared in the Edit Page of The Pioneer. Beijing insists that there is no religious discrimination in China, particularly against the Muslim populations (Uyghurs) of Xinjiang. Religious freedom has reached an ‘unparalleled’ level; it is at least what a document published by the State Council Information Office in Beijing on religious freedom in Xinjiang says. The publication coincides with the sensitive month of Ramzan. The newspaper Yili Daily announced that residents of the Yili Kazakh Autonomous Prefecture who wanted to apply for any type of immigration documents had to go to the police station near their ‘registered’ homes and provide DNA samples, fingerprints, voiceprints and a three-dimensional photo: “Applicants who failed to provide all the biological identification/information would have their applications refused,” says the newspaper. The prefecture of Yili, bordering Kazakhstan, has an ethnically diverse population of 2.5 million people; while 64.7 per cent belongs to ethnic minorities, the rest are Han Chinese. The number of applications for travel documents in Yili had ‘skyrocketed’ in the past year, from 20,000 in 2014 to 1,00,000 in 2015. Why did more than 2,00,000 apply for travel documents this year? The answer is simple: Discrimination in Xinjiang. Will the lives of the migrants be better elsewhere in China? Doubtful! For the foreign-based Uyghur rights groups, restrictions based on religion or discrimination have added to ethnic tensions in the region. Buddhist areas suffer from ‘restrictions’ too. In September 2014, an article on China Tibet Online, a subsidiary of Xinhua, praised Larung Gar Five Sciences Buddhist Academy saying out that Jigme Phuntsok Rinpoche, the founder was “a teacher of His Holiness (sic) the Thirteenth Dalai Lama” (the article forgets to mention that the same Khenpo Phuntsok visited Dharamsala and shared teachings with the present Dalai Lama). Amazing Communist China, speaking of ‘rainbow bodies’ (advancedlamas who can dissolve their bodies in a rainbow at the time of death)! The institute is today one of the world’s largest and most important centers for the study of Tibetan Buddhism in Tibet …and in China. 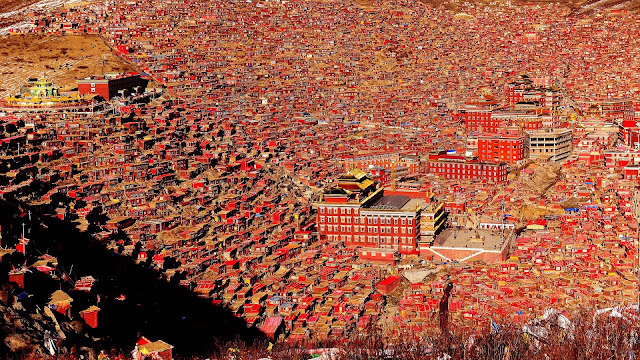 Following the demolition in 2001 of more than 1,000 dwellings at Larung Gar and the expulsion of hundreds of monks and nuns, the monastery, such a phoenix reappeared; today the Chinese authorities have decided to reduce its size again. Despite the fact that Beijing is trying to put up a brave ‘normal’ face in the world media, religious and political intolerance has grown tremendously under Xi Jinping. In every field, the Government has stepped up to control the media, the Internet and even what is taught in the universities. In these circumstances, one understands that Islam in Xinjiang or Buddhism in Tibet are both seen as subversive ‘splittist’ ideologies. The sad part is that some foreign companies are also sanctioning Beijing’s policies; the latest example is the cosmetic brand Lancôme, a subsidiary of L’Oréal of France, which cancelled a concert by Canto-pop star Denise Ho in Hong Kong. The crime of the young lady was to have dared to meet the Dalai Lama. ‘No good’, said Beijing, ‘You will not be allowed to sing in Hong Kong’; and Lancôme complied. The ironic part of the story is that Beijing is trying to take the lead of the Buddhist world, investing billions of yuans in ‘soft’ diplomacy. How can China be taken seriously on this?